Network Marketing gives everybody, no matter your level of education or your background, the same opportunity to make an incredible living, one that can surpass even the best-paid surgeons in the world. Young Living is leading the way in one of the fastest growing industries of Network Marketing. 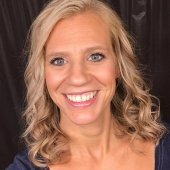 I know that you may be thinking, “There is no way that I could ever be in sales,” but that is where the misconception of Network Marketing comes into play. Every day we are talking with those around us about restaurants that we love, products that we have tried, movies that we have seen, or even the type of phone or newest app that we just “have-to-have.” Believe it or not, that is network marketing, every time that we talk to someone about a product or service that we use or like we are actively taking part in network marketing. That’s it! Plain and simple network marketing is not selling products to people, but rather sharing your testimonies and love of a product with your friends and family. I want you to think about the last time you ate at a restaurant that you thought was amazing! What did you do the next time you were with friends or family? You probably told them about the restaurant! You shared your complete experience with your friends and family, and probably told them to eat at that restaurant. Did the restaurant compensate you for sharing with others? Most likely the answer is no, they did not. However, it just goes to show you that if you try a product that you love, it is only natural to share it with others. In network marketing it is the same exact thing, only you are compensated for the word-of-mouth advertising that you are doing. Young Living’s exclusive products are part of the fastest growing industry out there, essential oils. By the year 2020, they anticipate that almost every home will be using some type of essential oil. Young Living is the world leader in essential oils. Everyone is starting to talk about essential oils and their health benefits. So whether you are looking to just supplement your monthly income, or you are looking for an extraordinary income to help you live the life of your dreams, Young living provides you with that opportunity. A traditional franchise or business may cost you tens-of-thousands to hundreds-of-thousands of dollars to start, while a Young Living business only cost $160! Purchasing a starter kit helps you and your family maintain health and wellness, while giving you the opportunity to grow a substantial business. Plus Network Marketing has been proven to thrive even when our economy is not. 2. Large Residual Income Instead of trading your time for income as in the traditional workforce you will have a residual income. Residual income is when you continue to get paid after the work is done. Examples include royalties from books, movies, or songs and also income that comes from real estate or business investments where you don’t actually have to be present to earn it. Whether you’re a stay at home mom or you work a traditional job doesn’t matter–you choose the amount of time and effort that you are willing to put into your Young Living business. You choose your hours, you choose your days, and you are your own boss. As you train your clients/team members and work with them, they become more independent and successful. As their success grows so does yours. The time you put into them multiplies, as they do the same with their clients. Their success breeds your success. Running your own Young Living business allows for many deductions, including office expenses, vehicle costs, business travel, insurance costs, phone and internet costs, even your product purchase can be deducted, plus many others. Increased tax deductions mean fewer taxes owed at the end of the year. Business icons such as Warren Buffett, Robert Kiyosaki, Donald Trump and Stephen Covey have endorsed network marketing as a viable and effective business model. In a Young Living home business, you are your own boss. Your freedom is awarded as a direct result of your efforts. You are able to choose who you work with, when you work, where you work and how much you work. You are in control of your life. Choose to run your life instead of having life run you. People are experiencing tremendous product results, and scientific research to back it up. Young Living is the first natural essential oil company that has FDA approval on some of its Products. Simply put, Young Living works! Building your own Young Living business can be both easy and rewarding. With over 20 years experience in producing the highest quality essential oils in the world. Young Living is the world leader in essential oils. They are the only company with a Seed to Seal Guarantee. Their team of experts guides you in understanding the products, and helps you grow a steadfast business with a strong foundation. Essential oils are one of the fastest growing industries, with Young Living leading the way as the World Leader in essential oils. Essential oil sales are projected to grow over 11 billion dollars in annual sales by the year 2020. Young Living is a part of several rapid growing industries including Wellness Industry, Weight Loss Industry, Chemical Free Living Industry and Network Marketing. All of these industries are enjoying record growth at the moment with Essential oils leading the way. The Young Living Compensation Plan provides you the opportunity to earn a quick return on your investment and build a long-term residual income that can provide you with financial independence. Sign-on Bonus For each new member that you get started with Young Living you will receive a $25 sign-on bonus with qualifying orders. For each person you get started with Young Living you will receive 25% of their orders for the first three months. That means combined with the sign-on bonus every person you get started in Young Living you will earn $50 (You must have your monthly order in to qualify to earn commissions). You are paid a percentage back of each person’s monthly order between 4-8% depending on which level of your organization they are in. 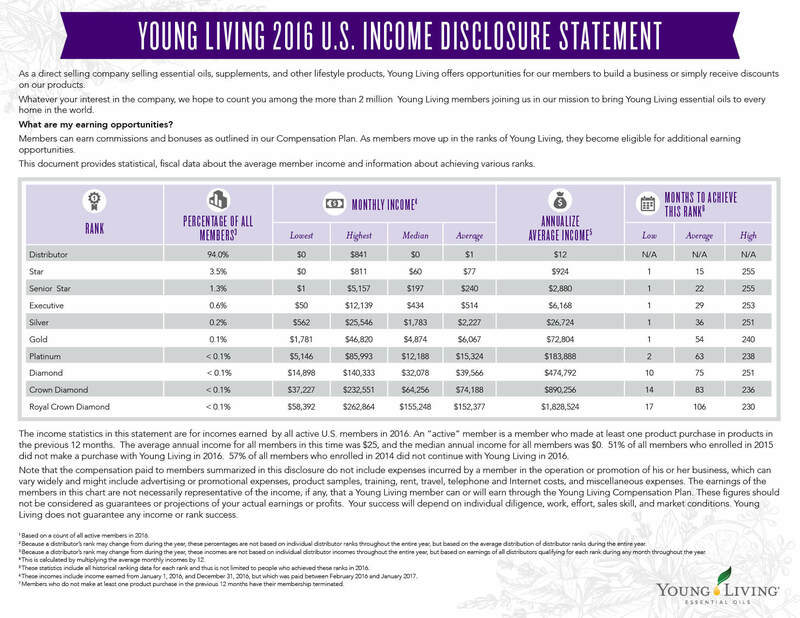 Stars, Senior Stars, and Executives are eligible to earn shares based on 1% of all Young Living’s monthly commissionable sales. The amount paid to the distributor is determined by the number of shares he or she earns. Right now shares run around $50 each and you can earn a total of 6 shares each month. For those ranked as silver and above you can earn up to 6 shares monthly(depending on your rank) Each share is worth 6.25% of all Young Living’s monthly commissionable sales. As you train up leaders within your organization you will be paid based on their different rank advancements. Young Living offers many different promotions to earn free trips and cars and tons of free product.